Fortunately, there's Schaum's. This all-in-one-package includes more than 550 fully solved problems, examples, and practice exercises to sharpen your problem-solving skills. 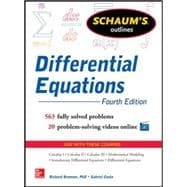 Plus, you will have access to 30 detailed videos featuring Math instructors who explain how to solve the most commonly tested problems--it's just like having your own virtual tutor! You'll find everything you need to build confidence, skills, and knowledge for the highest score possible. More than 40 million students have trusted Schaum's to help them succeed in the classroom and on exams. Schaum’s is the key to faster learning and higher grades in every subject. Each Outline presents all the essential course information in an easy-to-follow, topic-by-topic format. Helpful tables and illustrations increase your understanding of the subject at hand. Fully compatible with your classroom text, Schaum's highlights all the important facts you need to know. Use Schaum's to shorten your study time--and get your best test scores!